Yobbish behaviour in Britain's streets and schools will not be tolerated, Tony Blair said as he set out his priorities for a third term in office. 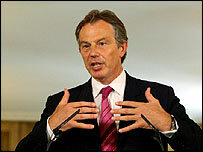 "Respect towards other people is a modern yearning as much as a traditional one," said Mr Blair. He put much of the blame on parents, saying he could bring in laws but could not raise people's children for them. He told his monthly news conference that the need for more respect was a key lesson from the election campaign. Mr Blair said the end of deference and preference did not mean society did not have any rules. He said people were fed up with street corner and shopping centre thugs, with binge drinking, vandalism and graffiti. A very small minority of people were making the law-abiding majority "afraid and angry". "I want to send a very clear signal from Parliament, not just the government, that this type of disrespect and yobbish behaviour will not be tolerated any more," said Mr Blair. He said there were deep seated cause of nuisance behaviour. They were "to do with family life in the way that parents regard their responsibility to their children, in the way that some kids grow up generation to generation without proper parenting, without a proper sense of discipline within the family". He continued: "I cannot solve all these problems... I can start a debate on this and I can legislate. What I cannot do is raise someone's children for them." Mr Blair denied moves to allow 24-hour drinking sent the wrong signal, saying local people would have tougher controls over pub and club licences. And he backed the Kent shopping centre which has banned hoods and baseball caps because they can be intimidating. The Conservatives said 24-hour drinking and more paperwork for police officers were hampering efforts to tackle crime. Shadow home affairs minister Edward Garnier said: "For the Prime Minister simply to wring his hands and say that 'something must be done' and that he wants 'to send a message' is about as helpful as putting a note in a bottle and throwing it into the sea." During the first of his monthly media conferences since his third election win, Mr Blair he said Labour would take forward a bold programme for government with "renewed purpose". Reform would be accelerated in the NHS, schools, welfare and support for working families, he promised. Mr Blair argued it was "fatuous" to suggest the government could not get its programme through with a majority of 66. At a meeting of the Parliamentary Labour Party on Wednesday, ex-ministers Frank Dobson and Glenda Jackson warned Mr Blair that he was a problem for Labour. Sources say Mr Blair told Labour MPs he wanted to ensure an orderly transition of the premiership. On Thursday he refused to add to his public pledge to serve a full term in office. "I think the party and in a sense the country just wants us to get on with the business now," said Mr Blair. His deputy, John Prescott, earlier denied that Mr Blair was a "lame duck" leader. On foreign affairs, the prime minister said he believed the UK had enough support to block the European Parliament's vote to end opt outs from the working time directive. Can law enforce good behaviour?